been designed and optimised for video conferencing in small meeting areas. It integrates closely with Google’s conferencing solutions and is easy to set-up and operate. A Google Apps account is the only requirement. Chromebase is related to the existing Chromebox computer currently sold and manufactured by Acer, Asus and HP. Chromebox is a more basic solution lacking a monitor that relies on Google Hangout, while Chromebase offers a more comprehensive, turn-key conferencing system. Acer Chromebase comes with the hardware one would expect from a conferencing system. The monitor is a large 24-inch full-HD screen that supports touch display. Four microphones and stereo speakers provide a good audio solution. Connectivity is handled by 3 USB 3.0 ports and one USB 2.0 port. 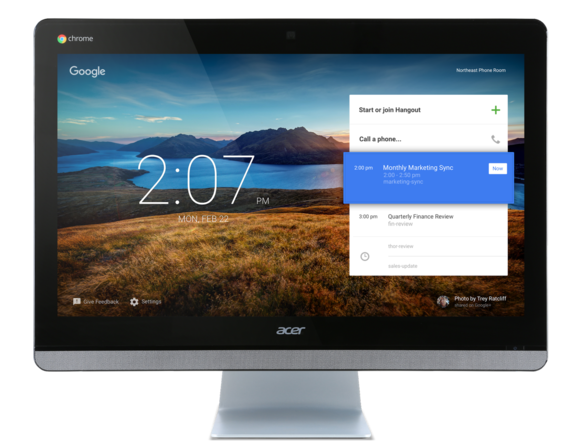 Acer has worked closely with Google to improve the user interface of Chrome OS. One guest account that doesn’t require login is available. 25 Hangout accounts are supported. The administrator in charge of the system can monitor the sound and video quality. Adjustments can be made using external admin tools. The administrator is notified using alerts when the sound and image quality drops below a certain threshold value. The price for Acer Chromebase is set to US$799 (NZ$1,174), which includes one year of support from Acer. It will initially be sold only in North America and Europe, and a roll-out to other continents is expected later this year. How does the Acer Chromebase compare to other conferencing systems on the market? Audio conferencing systems like Konftel 250 and Polycom Soundstation 2 cost between $800 to $1,000 and support 20-25 participants. Hence, a turn-key video conferencing system for a small company for $1,174 seems like a good deal.